I have never been a baker, though I have gotten a bit more adventurous since my husband bought me a stand mixer for Christmas. Still, even those adventures have been more of the cookie-type (and the occasional boxed cake mix). In fact, never have I ever made a cake from scratch...until this unbelievable recipe that I will continue to make again and again. Honestly, I was initially somewhat skeptical about this cake that not only doesn't require a mixer, but doesn't even require a bowl! All of the ingredients are simple enough, and they are all combined in the very pan in which you bake the cake. This cake is so moist and delicious that I was afraid that I was going to eat the whole thing myself - so I shared with my neighbor and my mother-in-law, who both gave it rave reviews as well. Had I known that making a cake from scratch could be this easy, I would have done it long ago! This recipe is one of the many delicious recipes that I made from Weeknight Dinners by Gooseberry Patch, which has quickly become one of my favorites. 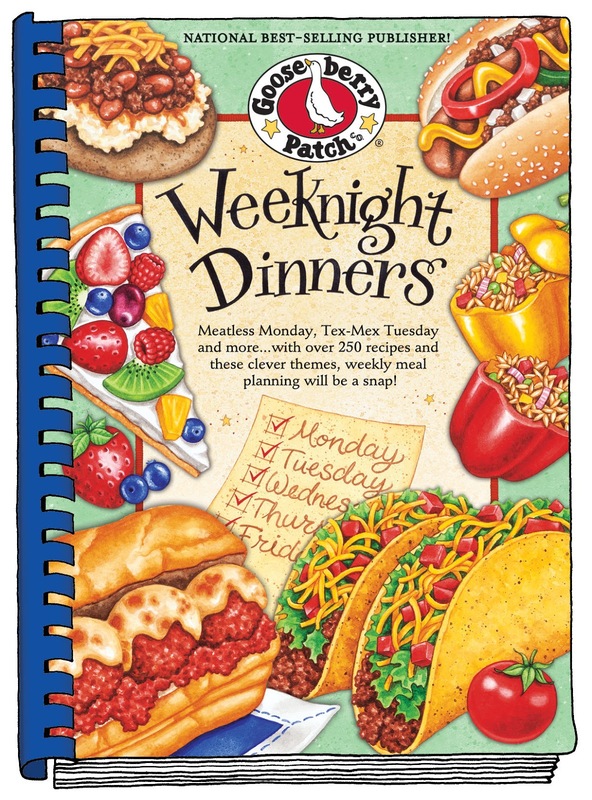 For more of our reviews on this fantastic and family-friendly cookbook, please check out our posts for Italian Baked Chicken and Savory Onion Roasted Veggies, which also hail from Weeknight Dinners. We are sorry, but the giveaway for this post has ended. Preheat oven to 350. Add flour, 1-1/2 cups of the sugar, cocoa, baking soda and salt to an ungreased 13"x9" metal baking pan. Stir with a fork to mix. Use a spoon to form 3 wells in the flour mixture. Pour oil into one well, vinegar into one well, and vanilla into one well. Pour cold coffee or water over all ingredients; stir quickly with fork until well mixed. Do not beat. Combine cinnamon and remaining 1/4 cup of sugar; sprinkle evenly over batter. Bake for 35-40 minutes, until cake tests done with a toothpick. This cake looks wonderful...I think I will have to give it a try this weekend. Gooseberry Patch has great recipes! I lost all my Gooseberry Patch cookbooks in our move from one state to another. Made me sad when I realized they are all gone. I love your recipes and ideas. I even miss my Christmas ones. I LOVE gooseberry patch recipes and I don't have this cookbood...please pick me! I collect GooseBErry cookbooks- they are so great. Love them....I don't have this one though.....haven't gotten any new ones in several years. I adorable the Gooseberry Patch Cookbooks! I have several and use them all the time......I don't have this one. I love the Gooseberry Patch Cookbooks, and would love to have this one! I'm definitely going to try this chocolate cake! I have a couple of these cookbooks; but I don't have this one. I'm going to try the chocolate cake. I love the Gooseberry Patch Cookbook!